Rupert Colville, spokesman for the UN High Commissioner for Human Rights. 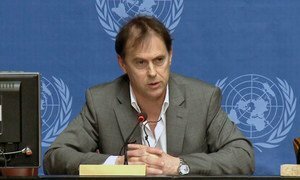 The United Nations human rights office today, deeply concerned about the escalation of violence in Venezuela, including the death of at least three people during protests on Wednesday, called on all parties to engage in dialogue to peacefully resolve the crisis. Thousands of people in big cities throughout Venezuela reportedly participated in protests against the detention of student demonstrators earlier in the week, as well as against rising crime rates and increasing economic hardship in the country, according to the Office of the UN High Commissioner for Human Rights (OHCHR). Yesterday, the Public Prosecutor reported that three people lost their lives, 66 were wounded and 69 detained, as a result of various clashes during and after demonstrations, the Office added. “We have also received worrying reports of intimidation of journalists, some of whom have had their equipment seized, as well as reports that some local and international journalists were attacked while covering the protests,” OHCHR spokesperson Rupert Colville told reporters in Geneva. “In addition, some protestors have reportedly been detained and may be prosecuted on terrorism charges. It has also been reported that some protesters, including minors, are being denied contact with family or lawyers,” he added. The Regional Representative of the High Commissioner for Human Rights in South America has called on the Venezuelan Government to ensure that the rights to freedom of peaceful assembly and freedom of opinion and expression are guaranteed, and that a prompt, full and impartial investigation into the killings and any act of excessive use of force is undertaken. He also called for all detainees to be promptly brought before justice in order to decide on the lawfulness of their detention or to order their release. “Perpetrators should be prosecuted and those found responsible for acts of violence, and in particular deaths, should be sanctioned with appropriate penalties,” said Mr. Colville. “We are especially concerned at reports of attacks on demonstrators by armed groups acting with impunity. The United Nations has expressed concern over Venezuela’s withdrawal from the American Human Rights Convention, which enters into force today, and stressed the move could have a negative impact on human rights not just inside the country but also in Latin America as a whole.